NOTE: If you have a paid subscription, the start day change will not be immediate, but will occur in that night's update. 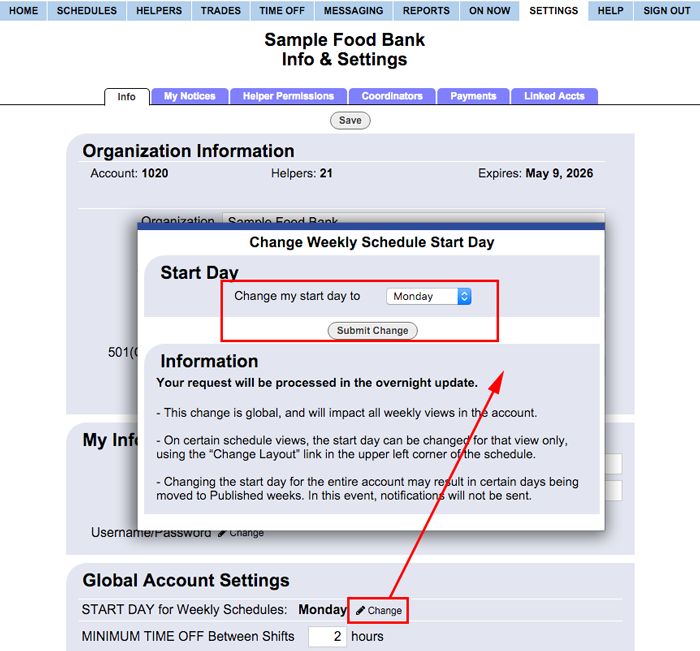 The Main Coordinator on the account can change the day of the week that all schedules begin on (and which daily tab appears on the left of the schedule views) using the SETTINGS>Info page. This option affects ALL USERS. Please note that if you have already created schedules for a number of weeks and published them, then changing the schedule start day can push certain unpublished days into a published week or published days into a unpublished week. Email notifications are NOT sent out to helpers when you change the schedule start day. The Calendar Monthly view start day can be changed independently using the "Change Layout" link to display beginning with a different day (Example, you can change the view to start with Sunday so that it looks like a standard calendar even if you have chosen a different weekly start day).